This high-quality Bingo Ball Set features double-numbered, multi-color, two-tone clear coated plastic bingo balls with black print. 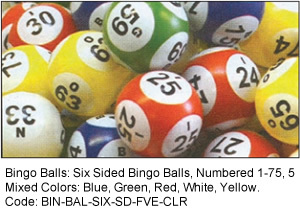 24" X 12" X 8"
Our six sided bingo ball set comes in five colors; blue, green, red, white, and yellow. The number is printed on the inside of the ball so it never wears off. These Bingo Balls are numbered 1-75. 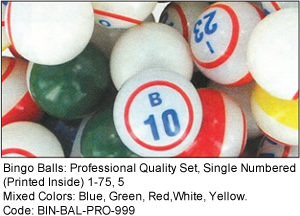 Our single numbered professional bingo balls are available in assorted colors. The number is printed on the inside of the ball so it never wears off. One half of the ball is white. The other half of the bingo ball is blue, green, red, white, or yellow. These balls are numbered 1-75. 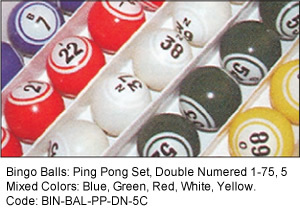 We carry either white sets or assorted-color sets of double-numbered ping-pong balls. 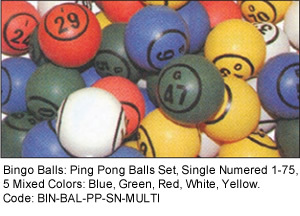 The assorted-color set includes blue, white, green, red and yellow ping-pong balls. These balls have bold black letters. 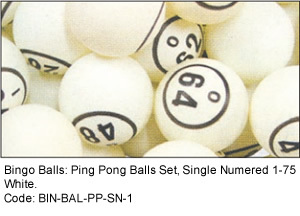 Ping-pong balls are numbered 1-75. 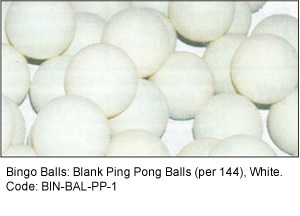 Blank ping-pong balls are available per 144. You can choose wood bingo balls or multi-colored plastic bingo balls. 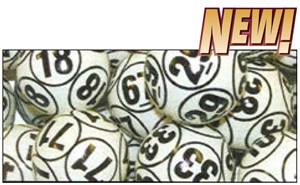 These bingo balls are made for small cage use and are 0.75 inch in diameter. Wood bingo balls and multi-color plastic balls are numbered 1-75. Blank wood bingo balls are available per 100 quantity. This 90 number ball set features 1.5" diameter ten-sided balls. 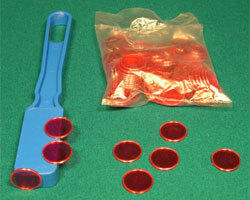 Bingo daubers (bingo markers) are available in 8 different colors. Our daubers are 3 oz. each. Daubers are available in red, magenta, pink, orange, green, aqua, blue, and purple. The minimum order for daubers is one dozen. Custom Bingo Daubers with your design are also available - visit our Custom Printed Bingo Dauber page! Choose from bulk packs of 1,000 bingo chips in assorted colors. Magnetic bingo chips are also available in bags of 100. Each of our magnetic chips has a small metal ring around the outside. Our "Magic Magnetic Wand" makes picking up these chips quick and easy. Each deck of 75 playing cards replaces the need for a cage and balls. Simply shuffle the deck and call out the numbers on the cards. These bingo call-out cards are ideal for use by churches, bus tour groups, etc. Used to secure your bingo paper to a table / playing surface, these Glue Sticks can help improve your game. Glue sticks are available in three dozen or gross quantities. Feel free to browse our many other Bingo Items including, Bingo Cage Sets, Bingo Hard Cards, Bingo Paper, Fingertip Slide Cards, Bingo Games, and much more! For a FREE 96-page gaming catalog, use our secure on-line Catalog Request Form or call us at 1-800-233-0282.